It is your first day at work. Perhaps fond memories bring a smile to your face. Perhaps not. It is a privilege to be gainfully employed and I view my first day on the job like the day that I accepted Jesus Christ as my personal Lord and Saviour. It is a day that I chose not to forget. It represents a new beginning. A transition from one state to another state – unemployed to gainfully employed in a secure job. A positive change and new outlook on life is looking back at me when I look in the mirror. One year earlier, I had completed my undergraduate studies and desperately wanted to work. At this time in history, the United States was deep into an economic depression under the Reagan Administration. The year was 1983. Finding employment for a recent college graduate with no meaningful work experience can be a daunting task. Finally, my day arrived. Having just celebrated my 24th birthday one week earlier, my first day at work was on July 23, 1984 at the Defense Personnel Support Center in Philadelphia, Pennsylvania. It is still a vivid memory that I cherish. I was passionate and eager to learn and grow. Ready to prove that I belonged. Ready to apply what I had learned in college. Ready to begin what I felt would be a productive career in the field of government contract negotiations and management. I liken it to a seed that had just been planted and more than eager to grow up to stand as tall and strong as an oak tree when it is fully mature. This is a message of growth from a disciple of Jesus Christ. Persecution can cause either growth or bitterness in the Christian life. The basic theme of this book is a proper response to Christian suffering. Peter knew that when the Christian stands for truth, justice, and fairness, they would need encouraging words to prepare them for the trials that would come. When you and I stand for truth in the workplace, persecution shall come. Peter writes this letter to give the Jewish believers a divine perspective on such trials so that they will be able and equipped to endure them without wavering in their faith. For starters, view your fresh start as a new opportunity to learn, grow, and change. Twelve men were selected by Jesus Christ to carry out His mandate – “To seek and to save that which was lost” (Luke 19:10) – after His death. His disciples received instructions, guidance, and counseling, for three and one-half years. A disciple is a learner, student, follower, and apprentice. It implies acceptance of the teacher’s teachings and imitation of His practices (Luke 6:40 and Isaiah 8:16). Jesus’ followers were called disciples (Luke 22:29), as are all Christians (Luke 14:26-27 and Acts 9:36). Part of their growth process was for some to abandon their current professions – fishermen (Simon Peter, Andrew, James-son of Zebedee, and John), tax collector (Matthew), Philip, Bartholomew, Thomas, James (son of Alphaeus), Thaddaeus, Simon (the Zealot), and Judas Iscariot – and follow Jesus. Jesus was their teacher, mentor, advisor, counselor, confidant, and protector. As followers and eyewitnesses, they observed His actions and obeyed His teachings, while taking heed to His consistent nature. Their leader was not a hypocrite, so the followers were open to grow and learn. The Apostle Peter’s message of growth is extracted from what he learned from Jesus. During this time in biblical history, Christians were savagely treated in Rome, and this policy was probably reflected throughout the empire. Also, Christians were found throughout Asia Minor (Republic of Turkey), as stated in chapter one, verse one. Christianity had not yet been received the official Roman ban, but the stage was being set for the persecution and martyrdom of the near future. In the book of Romans, the Apostle Paul writes a comforting message of encouragement to the saints at Rome. Paul’s writings mirror his gift of exhortation and are overwhelmingly encouraging to his intended audience. During his conversion from King Saul on Damascus Road, he had a conversation with Jesus. Although he was not a disciple of Jesus, Paul bears the title of an apostle because of his personal encounter with Jesus on Damascus Road (Acts 9:4-6). Considered his greatest work, Paul’s message of growth focuses on our responsibilities to God. First, we are to recognize that we must offer our bodies a living sacrifice. Live a holy lifestyle that is acceptable unto God. Eliminate the cursing, bad attitude, backbiting, lying, and whatever does not represent God favorably. That is our reasonable service, or the least that we can do. Next, we are not to be conformed to this world in caring out His mandate. Do not follow man’s lustful desires for fame, fortune, and prestige. Instead, we are to renew our mind with the word of God and in accordance to His will. In doing so, we demonstrate to the world and prove what is good and acceptable. Lastly, we are to think soberly, and not be puffed up, according to the measure of faith that God has dealt to each of us. To be high-minded means to put self before others. That does not produce growth but stagnates it. Placed first among his thirteen epistles in the New Testament, this book explores the significance of Jesus’ sacrificial death. Using a question-and-answer format, Paul records the most systematic presentation of doctrine in The Holy Bible. It is a book of practical exhortation – encouragement. Key words such as righteousness, faith, law, all and sin each appear at least sixty times in this book. Growth is a process that happens over time. It never stops. The workplace is an environment that changes virtually everyday. Our ability, or inability, to be flexible to these changes either propels or stifles our personal growth. This process of growth, according the word of God, involves two meaningful steps: (1) A correct attitude that is required to promote growth, and humility, and (2) Be ever mindful of the small beginnings. This process is expressly recorded in The Holy Bible as a guide for us to follow, apply, and live by. Like the seed that is a small source of life, as it is planted into good ground, it grows to a mature state over time. It reproduces after its own kind (Genesis 1:11-12). 1. Auxanō – “to grow or increase”, of the growth of that which lives, naturally or spiritually. 2. Auxēsis – “increase” – Ephesians 4:16; Colossians. 2:19. God created man in His image and after His likeness (Genesis 1:26). Further, man is fearfully and wonderfully made (Psalm 139:14) and even the very hairs on our head are all numbered (Matthew 10:30). God designed our body parts to work together in unison so that we can function at our optimum levels. The more cohesive the group, the better it works together. Similarly, we are supposed to grow together as a cohesive work group on the job without giving preference to one over another. Then, God gives the increase. As God unites Christians with Himself, Christ also brings them into a harmonious relationship with one another. This harmony is accomplished by that which every joint supplieth. The spiritual gifts mentioned in verses 7 through 15 are figuratively likened to the various “joints” or “ligaments” of the body. Christ joins believers together and unites them by the divinely ordained ministries of Christians who possess diverse spiritual gifts, which are exercised and used among believers for the common good – even at work. As such, the productivity of everyone involved increases. Working together, while acknowledging your role on the team, is what makes the whole team cohesive, dynamic, and creative. The Greek word holding means to hold fast to someone as to remain united with Christ (Head). Having nourishment ministered, and knit together means being supported and united. From Christ (Head), then, the church (body) derives spiritual growth as it is supported and untied by the various ministering believers (joints). In doing so, we increase in Him and can be the light that is so desperately needed in the workplace. 3. Huperauxanō – “to increase beyond measure”, is used of faith and love, in their living and practical effects – 2 Thessalonians 1:3. With love as the motivating factor, you cannot fail. Because love never fails. The Apostle Paul again expresses his pleasure with the spiritual growth of the intended audience. His earlier fears have been dispelled based upon the testimony of the Thessalonians. This book is Paul’s second letter to them in response to certain reports – from Timothy – that had come concerning their progress. What is significant about Paul’s message is that he saw such potential in this little church to the north that he established on his second missionary journey. During Paul’s day, Thessalonica was the capital of Macedonia. His ministry in the city lasted only one month, yet this city became famous for its wealth as well as its attraction of a strange mixture of Roman high society and pagan sensuality. This influx of cultural diversities created confusion and conflicting beliefs about Jesus Christ. However, this small church’s love and faith caused growth beyond measure because it was founded on Paul’s steadfast love of Christ. Be open to learn AND grow! Source: Give God the Glory! Called to be Light in the Workplace, 2003 – by Kevin Wayne Johnson, Chapter 1 (Growth). What is My Role at Work? Very soon, I will conclude a 27-year career of federal service. I often reflect upon my humble beginnings in 1983; My first day on the job in Richmond, Virginia after completing my college education. From the beginning, God’s charge is for us to let our lights shine amongst those within our sphere of influence. Below is an encouraging piece that I wrote about ten years ago as a means to keep us focused on kingdom principles in the workplace. As it relates to the workplace, growth is the phase when we learn to adapt to the environment where God has placed us. The workplace can be compared to a community that functions at its best when people chose to work well together and are genuinely kind to one another. In reality, very few offices function at their best due to the sinful nature of man. God’s commandment to do unto others as we would have them to do unto us (Matthew 7:12) is rarely, if ever, actualized. What is desperately needed in the workplace is for God’s chosen one’s to be the light that will remind your co-workers about the enthusiasm that had when they were first gainfully employed. Remind them of the dreams that they was had but have lost along the way. The development of one’s skills, abilities, and knowledge is self-initiated as we strive for excellence in our chosen career field. Hard work, practice at what we do, a desire to become the best in our chosen profession, accepting risky assignments, willingness to travel, and moving out of our comfort zone are positive steps to strengthen self and demonstrate a passion to go beyond the call of duty. Be light to others as you develop your skills for a fruitful future in your chosen career field. Exemplify excellence in character, integrity, reliability and workmanship throughout your entire workday. Be the spark that encourages your co-workers to develop their skills and motivate them to follow their dreams. Maturity is the end result of the growth and development phases. The mature worker accepts responsibly for actions taken and career progression. 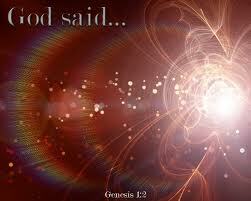 In the beginning of God’s recorded Word, it is written, “And God said, Let there be light, and there was light. And God saw the light, that it was good: and God divided the light from the darkness (Genesis 1:3-4).” Light created organization where there once was chaos and it dispelled darkness where it was once void (Genesis 1:2). This happened in the beginning before God planted seed that brought forth vegetation (Genesis 1:11). The seeds that we plant into our respective careers will produce fruit in our lives, and equally important, in the lives of others. Let your light so shine and your maturity illuminate in the workplace! Cause others to have a desire to achieve results that are visible as a result of your mature approach to office situations and circumstances. Excerpt: Give God the Glory! Called to be Light in the Workplace (2003), Part I, by Kevin Wayne Johnson. 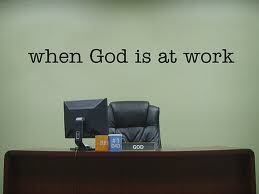 Our Workplace – A Time and Place to Glorify God! I began writing in the year 2000 when a brother in Christ that I met at a training course in New York City challenged me, and others, to complete that book that was waiting to be released. Three years later, I penned the second book in the Give God the Glory! series based upon what I witnessed in the workplace relative to workers at all levels: Entry-level, journeyman level, and senior-level. God spoke to me to explain the simple truth of the gospel in a manner that many could receive, apply, implement, and grow. I chose to respond to God’s assignment. During my 19 years in the workforce, 15 with the federal government and four within the setting of corporate America, I have seen friends, peers, associates, and colleagues, at all levels within the organization, encounter multiple problems while at work. I, too, have faced them. In most instances, the affected person feels isolated, alone, trapped, with nowhere to turn. You are NOT alone. Give God the Glory! Called to be Light in the Workplace, exposes the challenges that all people face on the job. Throughout the history of this country, there has been tremendous change in the workplace. America has shifted from an agricultural society (late 1600’s to 1880), to an industrial society (1890 to 1980), to an information society (1985 to present). Keeping pace with these constant changes is a fulltime job in and of itself. Having a personal relationship with God, through Jesus Christ, is the assurance that we can overcome all of the pressure and change that is inherent to a typical day at work. The workplace is defined as a place where people are employed; the work setting in general. Part One – the formative years – is intended to remind the mature worker of our humble beginnings in our respective careers. It will also encourage those entering the workforce to focus on the important things and to dismiss the unimportant. I still remember my first day at work on July 23, 1984, exactly one week after my 24th birthday, at the Defense Personnel Support Center in Philadelphia, Pennsylvania. I vividly remember my first supervisors – Mr. Delma Hughes and Mrs. Catherine Ward – as I began my classroom and on-the-job training assignments in an old government warehouse equipped with third-hand furniture that was purchased at a General Services Administration auction. There was no air conditioning to cool the stifling Philadelphia heat that permeated the setting where I worked. I still send Mrs. Ward a Christmas card every year as a sign of appreciation for showing her light in the midst of less than ideal working conditions. As we enter the workforce and transition from growth to development to maturity, we look to peers, supervisors, and other mentors to give us advice on how to advance to the next level. Mr. Hughes and Mrs. Ward, thank you. Part Two – the journeyman years – targets the group of workers who have learned and mastered the basic elements of the job and seek advancement into mid-level positions. During this phase, we tend to view our position as more than just a job, but a career. We find ourselves being asked to mentor others at the entry level while, at the same time, earnestly seek senior level officials to assist us with our next career move. Intelligence, tact, savvy, professionalism, integrity, balance, ethics, responsibility and accountability are the key elements to succeed at this level. It is during this stage that we transition from learning to leading. It takes more than just the inner drive to succeed, it is also reliance upon the people that God places in our paths to lead, guide and direct us. Those whose trust we have earned through excellence and demonstrated potential on various projects over an extended period of time. Those who will give us just enough room to make mistakes, yet protect us from their less passionate peers who salivate at the opportunity to openly humiliate their subordinates for the slightest of errors that have been committed. God placed wonderful people in my path in 1993 that were instrumental in launching my career development into the executive ranks. 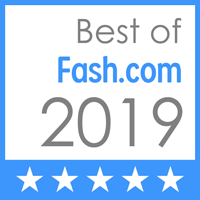 They too, are on my Christmas mailing list as a means to express my continued love for their protection and to keep them apprised of my family development and overall wellness. 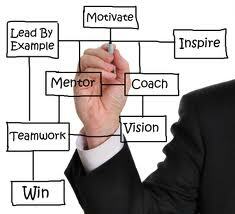 Formal leadership training reinforces the principle of application and self-motivation so that we will encourage others to reach their potential. Jesus taught His first disciples to “launch out into the deep” (Luke 5:4) and trust in His Word. In doing so, the fisher men, soon to be His disciples, let down their nets and caught so many fish that their nets broke (Luke 5:6)! Part Three – the mentoring years – encourages us to reinvest time and energy into people. People are the human capital of any organization and the most valuable commodity in the workplace. A brief look at the lives of such notable historians such as Evangelist Billy Graham and Dr. Martin Luther King, Jr. are inspirational stories of how two men, raised in the southern part of the United States, taught the world about the importance and awesome responsibility of raising the level of productivity of others. In the book of Genesis, chapter 1 and verse 28, God blesses man – male and female – after creating them in His image and after His likeness. God then gave four instructions and said unto them, “Be fruitful, multiply, and replenish the earth, and subdue it.” Through the lives of Evangelist Graham and Dr. King, we have vivid examples on how to raise the level of productivity of others, as God instructs us. Caution: “For the love of money is the root of all evil…(1 Timothy 6:10).” Corporations thrive on their ability to make money and lots of it! In an era of antitrust, accounting irregularities, countless lawsuits, constant restructuring, employee layoffs, and outlandish bonuses to top executives, God can and will send a stern warning “to humble ourselves under the mighty hand of God, that he may exalt you in due time” (1 Peter 5:6) and “Humble yourselves in the sight of the Lord, and he shall lift you up (James 4:10).” In the book of Ephesians, Chapter 5, the Apostle Paul challenges and encourages the saints at Ephesus to walk as children of light. He begins in chapter 1, reminding them that our Heavenly Father has blessed them with all spiritual blessings in heavenly places in Christ (verse 3) and that He has chosen them before the foundation of the world that they should be holy and without blame before Him in love (verse 4). We have the same covenant right and God is speaking to us today. We are to be followers of God as dear children and walk in love, as Christ loved us (chapter 5, verses 1 and 2). Throughout chapter 5, Paul was inspired by God to write His instructions: “For ye were sometimes darkness, but now are ye light in the Lord: walk as children of light” (verse 8). “And have no fellowship with the unfruitful works of darkness, but rather reprove them” (verse 11). “But all things that are reproved are made manifest by the light: for whatsoever doth make manifest is light. Wherefore he saith, AWAKE THOU THAT SLEEPEST, AND ARISE FROM THE DEAD, AND CHRIST SHALL GIVE THEE LIGHT” (verses 13 and 14). Across the United States today, we collectively celebrate the contributions of an outstanding organization that promotes and advocates for peace. They are the Peace Corps! The Peace Coprs is an American volunteer program run by the U.S. Government, as well as a government agency of the same name. The stated mission of the Peace Corps includes three goals: (1) Providing technical assistance, (2) Helping people outstide of the U.S. to understand U.S. culture, and (3) Helping Americans to understand the cultures of other countries. The work is generallt related to social and economic development. Each program participant is an American citizen, typically with a college degree, who works abroad for a period of two years after three months of training. Volunteers work with governments, schools, non-profits, non-government organizations, and entrepreneurs in education, hunger, business, information technology, agriculture, and the environment. The program was established by Executive order 10924, issued by President John F. Kennedy on March 1, 1961, and authorized by Congress on September 22, 1961, with passage of the Peace Corps Act (Public Law 87-293). The act declares the program’s purpose as follows: To promote world peache and friendship through a Peace Coprs, which shall make available to interested countries and areas men and women of the U.S. qualified for service abroad and willing to serve, under conditions of hardship if necessary, to help the peoples of such countries and areas in meeting their needs for trained manpower. Since 1961, over 200,000 Americans have joined the Peace Corps and have served in 139 countries. Likewise, we learn from the Word of God that peace is a key attribute that promotes well-being, friendships, good health, and abundant living. Jesus teaches us that He will leave us peace (John 14:27), that peace comes from God (Romans 1:7), to live in peace (2 Corinthians 13:11), to have the peace of God (Philippians 4:7), and that peace can be multiplied through us (2 Peter 1:2). Promote peace today! It’s benefits are enormous and profound! Keep up the great work Peace Corps.